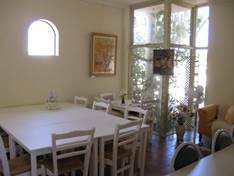 Come and enjoy the lovely ambiance, peaceful atmosphere and great paintings. Monet Main Gallery is the larger, sunlit gallery continually highlighting works not to be missed. Its high ceilings, roof window and brick feature column, together with the views to the back terrace, make this a very special space for viewing works to be particularly featured. Monet has many well known practising and professional artists whose works are available, and this big room with angled walls and so much natural light, does justice to their paintings and in particular those that are large. There is a big community table for people to sit and talk art. This gallery is on occasion throughout the year, the venue for solo or special themed exhibitions. Although the main gallery now shows fewer solo exhibitions it always has great display of on-going works. This main spacious and atmospheric gallery is also now available for small, informal weddings on Saturday evenings or Sunday afternoons during late-spring, summer and autumn. On entering Monet Gallery of Fine Arts you are in the ‘Provence Gallery’ and sales area. This angles back to a small lounge section opening up to the side courtyard. This welcoming area impacts immediately with the talented visual art of many of the 40 -50 artists who are represented by the gallery, especially displaying those pieces that are not overly large as the space is more intimate. These paintings form the nucleus of an on-going, exciting mixed exhibition. You will find the full spectrum of styles on display in this constant yet always changing exhibition of paintings; the perfect place to browse or buy affordable art for your home or work-place. 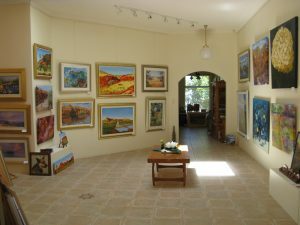 The paintings are for sale indirectly from the artist, with the gallery selling on commission. Impressionist Gallery; This lovely designed part of the complex protrudes into the car-park, and was purpose built to house the ‘atmospheric’ watercolours of artist Maureen Sylvia: the owner of the gallery. 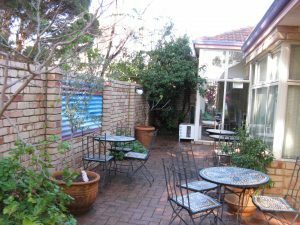 In addition it is used for annual poetry readings and work-shops. It can, however, have multiple uses and on occasion be hired for small, weekend, independent solo or group exhibitions. It is also available for hire for music recitals and meetings that fit around the gallery happenings.Maureen enjoys painting large 'wet on wet' watercolours and also writes and illustrates children's poetry. Her poetry books are on display in this room. She sometimes has classes for children in writing and art. Artists at Work: During the first 3 Sunday afternoons in August (or sometimes other months) you will find there are 5 or 6 artists busy painting on site on each Sunday. This has become an enjoyable annual event. Depending on the weather they will be set up inside or out with a cluster of paintings around them. Visitors enjoy a chat and sometimes a purchase. Studio: This usually has Maureen Sylvia’s watercolours and poetry on display. During other times in the year you will sometimes find an artist painting in the studio or courtyard, as Monet’s artist in residence. Then, their work is featured instead. 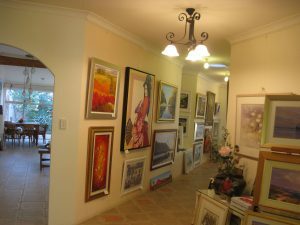 The artist’s presence is complementary to the main purpose of the gallery which is to exhibit work by established artists and to encourage people to learn to paint. The studio, which runs off ‘The Impressions Gallery’ is also used for one day workshops and on occasion classes.